The renowned western artist John A. Bruce, best known for his portraiture, visited Ajijic on Lake Chapala, probably in the 1960s. His name was recalled by long-time Ajijic visitor Dr. Jim Vaughan when I interviewed him in 1990. Vaughan said that Bruce had drawn a sketch of him, but that it had required several sittings, because Bruce “liked his tequila”. It is unclear how long Bruce stayed in Ajijic or whether he visited more than once. John A Bruce was born in Los Angeles, California, on 8 April 1931. He served in the U.S. Army from 1949 to 1952, including 18 months as an infantryman in Korea. Following military service, Bruce began a long career as a commercial artist in California. 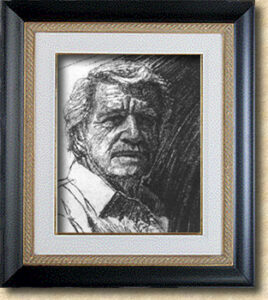 He worked as Art Director at the Field Service Department, North American Aviation in Downey from 1952 to 1957. He then worked as an illustrator at Aerojet General Corp., in Sacramento, for three years, before starting his own company, Cal Graphic Advertising in 1960. Cal Graphic lasted three years until 1963 when he became Art Director at Barnes/Chase Advertising, in Santa Ana, a position he held until 1967. Following Barnes/Chase, he became Vice President of Gil Franzen Art Studio, in Los Angeles (1967-1969) and then Art Director at the Independent Press Telegram, in Long Beach (1969-1973) before once again seeking his independence by becoming a free-lance artist working on Disney’s EPCOT project in Burbank. John Bruce. A Mountain Man. Bruce studied art at the Art Center School in Los Angeles and the Chouinard Art Institute, and gained a B.A. in Psychology (with a Minor in Art) from California State university in Los Angeles in 1965. After the 1970s, Bruce focused more on his own art, as a partial list of his solo and group exhibitions confirms. His solo shows include Ghormley Gallery Los Angeles (1964); Les Li Art Gallery Los Angeles (1969); Upstairs Gallery in Long Beach (1971); and Christine’s of Santa Fe Gallery in Laguna Beach (1993). Invitational. 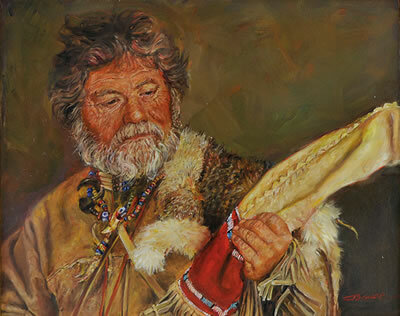 Bruce’s group shows include: Laguna Beach Art Festival Laguna Beach, (1962-1965); Butler Institute of American Art Youngstown, Ohio (1970); Newport Invitational Art Show, Newport Beach (1975); Death Valley Art Show in Death Valley, California (1979-1982); American Indian & Cowboy Artist’s Show in San Dimas, California (1987-1995); El Prado Gallery Sedona, Arizona (1989); Prairie Fire Show Wichita, Kansas (1990-1992); Pepper Tree Art Show, Santa Inez, California (1991 to 1996); San Bernardino Museum, California (1992); AICA (American Indian & Cowboy Artists) at the Autry Museum, Los Angeles (1996-1998); and Wind River Gallery in Aspen, Colorado (1997). John Bruce. ca 1980. Native American Boy. 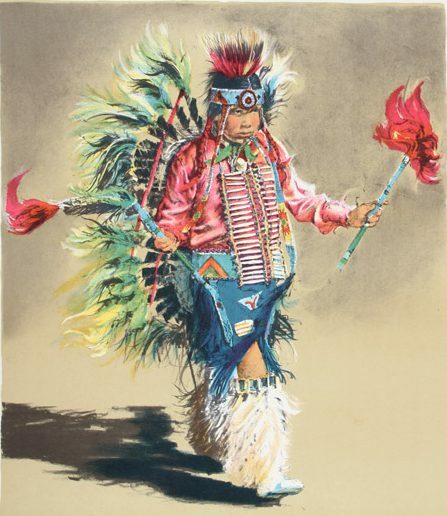 Bruce has won numerous awards for his art, including “Best of Show” at Vision 99 – Chicago Windy City Artists (1999), at American Indian & Cowboy Artists (1992; Autry Museum Masters of the American West (1996) and Festival of Western Arts, San Dimas (1996). Artworks by Bruce were adjudged “People’s Choice” at American Indian & Cowboy Artists (1988) and Art of the West Magazine (1992). At American Indian & Cowboy Artists, Bruce won Eagle Feather Awards in 1988 and 1989, and a Gold Medal for Oil Painting in 1992. At the Prairie Fire Art Show in Wichita, Kansas, he won Gold Medals for Drawing in 1990 and 1991 and for Oil Painting 1991. He also won a California International Artist of the Year award in 1975 and the John Grayback Award for Oil Painting at the American Artists Professional League (New York) in 1988. 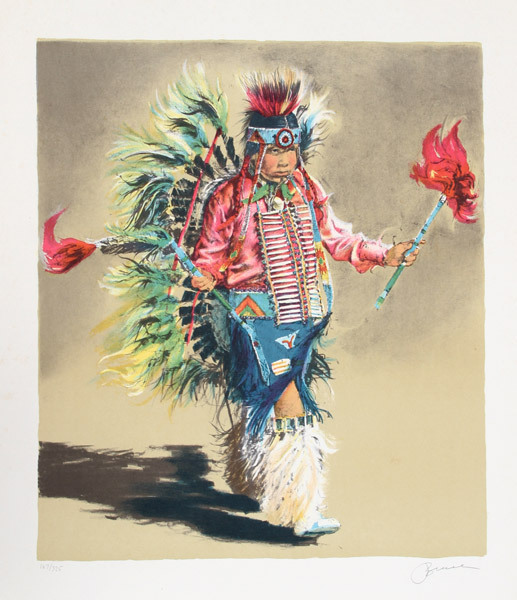 A number of lithographs by Bruce are in the permanent collection of the Smithsonian Institution in Washington, D.C.
Bruce has resided in Mariposa, California for many years and continues to find reward in his art. David Lemon. “Story of Courage”. 2010 blog post. Bruce Douglas was the pen-name of Theodore Wayland Douglas, who was born in Indianapolis 29 May 1897 and died in Mexico in about 1961. Bruce Douglas is reported to have been a recent visitor to Ajijic in Neill James’ article about life in Ajijic published in 1945, so we can safely assume he visited in 1944 or very early in 1945. It is unknown if Douglas returned later to the Lake Chapala region, though he resided full-time in Mexico City from at least as early as 1943 until his death. Douglas served in the U.S. Navy during the first world war. Shortly after the war, he was awarded his bachelor’s degree from Miami University, Oxford, Ohio, in 1918. In 1922, he received his Masters degree in English from the University of Illinois. He worked as a reporter on the Indianapolis Star 1919-20. Douglas began his writing career after many years teaching in universities. From 1920 to 1932, he undertook postgraduate work while also teaching English at a series of universities, including Indiana University, the University of Illinois, the University of Chicago, and the University of Oregon. He also taught at the University of Texas and the State College of Washington. Douglas married twice. His first marriage was in 1922 to Lucretia Lowe in Champaign, Illinois. His second marriage, in about 1929, was to a Mexican girl, Lee Patricia Bohan, born in 1906. The couple had one son. It appears likely that Bohan was a student, or university colleague of Douglas. She gained a B.A. in French from the Southern Methodist University in Texas in 1927, and then presented her Master’s Thesis the following year at the University of Chicago. (Her thesis was entitled: “Fielding’s Portrayal of the Country Squire (Henry Fielding)”. Bohan died in California in 1984. Douglas was a prolific writer of short stories during the 1930s and 1940s. His first success in getting stories published was in May 1930 when Ace-High Magazine accepted “The Ghost of Oro Gulch”. That same year, he also saw at least three other short stories in print: “Code of the Range” in Western Rangers, “The Cowpoke from Coyote” in Western Trails and “For Love of a Bandit” in Ranch Romances. After 1932, Douglas dedicated himself full-time to his fiction writing. 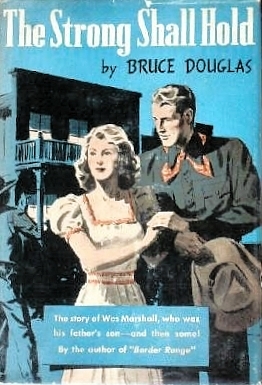 Between 1930 and 1954, he had more than sixty short stories and several short novels published in the U.S., Canada and U.K.
His books include Border Range (1942) and The Strong Shall Hold (1943), in which “Wes Marshall fights for his father’s spread” (both western novels) as well as a thriller Tropical maze, published in the U.K. in 1948. In 1934, one of his stories, “Holdup at Dry Wells” appeared in the same issue of Cowboy stories (vol. 26, no. 3) as “Off the westbound freight”, by John Mersereau, another author associated with Ajijic.